A robot who first appeared in the arcade game “Rockman 2: The Power Fighters.” in “Rockman 8” some light was shed on his past, revealing that he had been chasing the Evil Energy embodiment through space when he arrived on the Earth, and that he saved Rockman’s life from the injuries received during his battle with Dr. Wily. 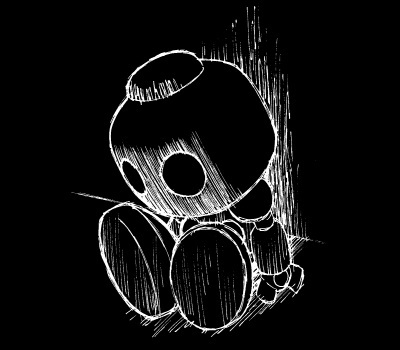 The extent of his abilities are shrouded in mystery, but compared to the likes of Rockman and Forte, his power is thought to far exceed that of the others. It should be interesting to note what kind of appearances he’ll make in the series from here on out. Left caption: Duo learned of how Rockman fought all along to protect peace on Earth, and used his miraculous power to save Rockman’s life. 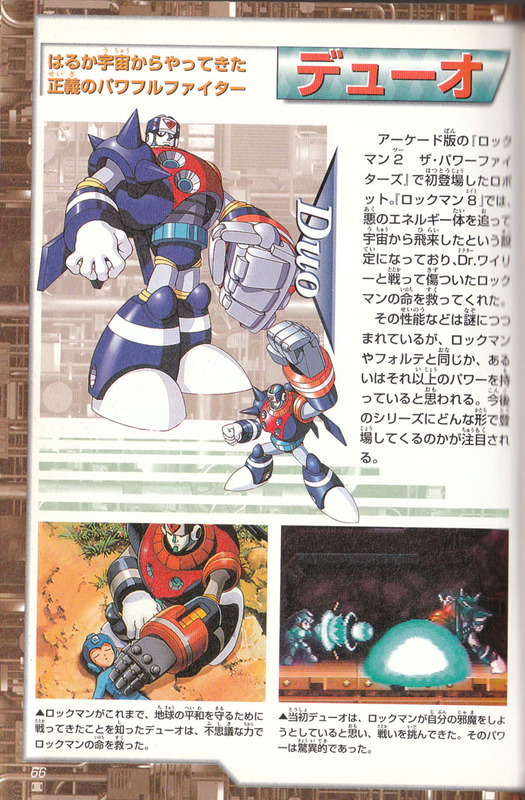 Right caption: At first, Duo thought Rockman was trying to interfere with his mission, and so they met in battle. His power was astonishing! The two robots were on a direct collision course! 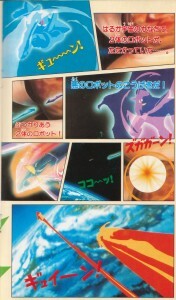 That was an anime digest that appeared in the Rockman 8 Super Daizukan. Hope you remembered to read it from right to left! And so the two combatants came to crash-landing on Earth, upon a mysterious island that Dr. Wily just happened to have been using as a base of operations. If you noticed that Duo looked a little odd there, that’s probably because Duo’s body was completely different before Dr. Right found and repaired him. 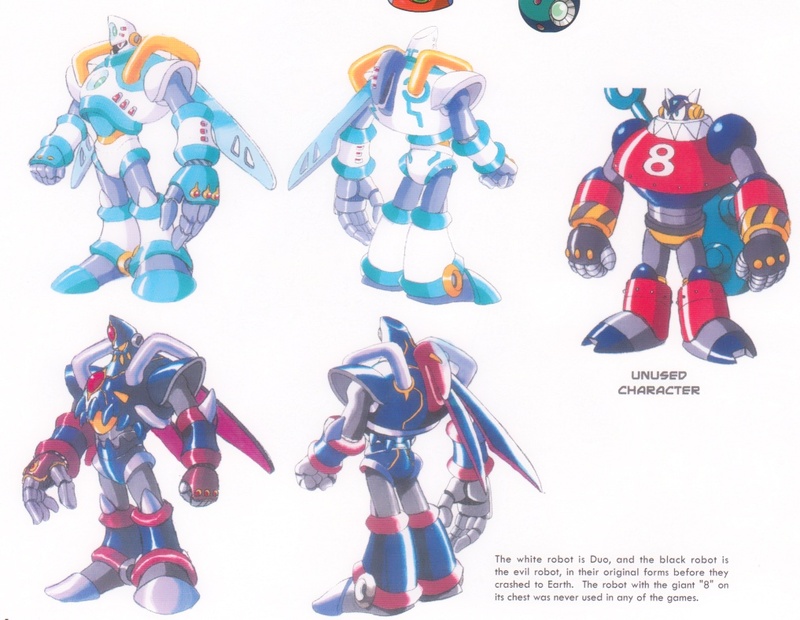 His original body was shown in the Mega Man Official Complete Works book on page 80, along with the evil robot and an unused enemy design. Either from the battle or from crashing to Earth, Duo must have required some extensive body reconstruction, which is probably why he looks like he was constructed from miss-matching spare parts. I wonder if he ever misses having a pinky on his left hand? Tomorrow: Digging deeper into the mysteries of Duo! 2 Comments to "He Came from Outer Space"
That unused character doesn’t appear in Tengu Man stage in MM&B? 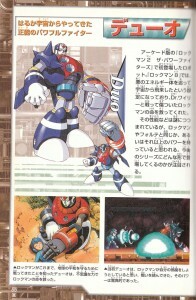 You are correct, although they changed a few things around with its design in the Rockman & Forte appearance. « August wasn’t my best month for blogging.